Not impressed with the results you are getting out of your lawn fertilizers? Looking for that secret ingredient to improve your lawn and keep it green all year long? Consider using Jonathan Green’s Magical and Love Your Lawn, Love Your Soil. These two products feed your soil, not your grass. Traditional fertilizers only provide nutrients that your grass will absorb slowly. However, if your soil is out of balance or in poor condition, then those nutrients that you spend lots of money on will not be absorbed properly and you are essentially throwing money away. So, how do you keep your lawn in balance? Consider Jonathan Green’s Mag-i-cal. This product will quickly raise soil pH to levels that your grass will thrive in. When your lawn is too acidic, the grass roots essentially shut down and will not absorb the fertilizers you are applying. One application of Mag-i-cal during the year will typically be all that you need to keep your lawn in balance. However, if you have a lawn that is knowingly way out of balance, you will want to grab a soil test kit and test the soil both before and after one application of Mag-i-cal to see if another application will help further. What if your lawn is like most Pittsburgh lawns and it is clay-like and very compacted due to years of traffic and settling? 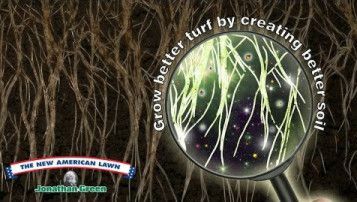 Consider Jonathan Green’s Love Your Lawn, Love Your Soil. This product is revolutionary and exclusive to the Jonathan Green brand. The main ingredient for this product is mined from the southwest of the USA and it naturally breaks down clay-like, compacted soils to turn them into loamy soil. In as little as 2 applications, you can turn your soil from poor to perfect! Love Your Lawn is better than aeration because it conditions soil down to 4 feet deep and it easy to apply through a lawn spreader (no heavy or time-consuming tools to use). With all of this said, you will still want to feed your lawn with fertilizers throughout the year, but these products will improve your soil to make those fertilizers work to their full benefit. With healthier grass, you will have less weeds and lawns that will not dry out so much during the summer.Be sure to stop by our Lawn and Garden Department this spring for everything you need to get your lawn off to a great start this year! We have everything in-stock, including grass seed, top soils, fertilizers, organics, and crabgrass preventers.